The 2019 riding season will soon be full throttle. For motorcyclists living in the South or out West riding season is never-ending. Riding all year long, detailing motorcycles becomes routine. Routines are wonderful but limiting at the same time. They are wonderful because we are able to go through the motions without much thought or consideration. The problem with routines is we settle for what we know without realizing what we are missing. 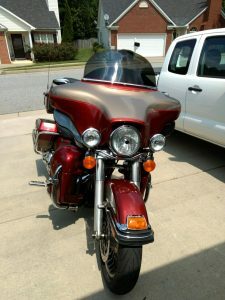 Motorcycle detailing does not have to be difficult or take a lot of time. When washing or detailing a motorcycle becomes more work than rewarding we ride a dirty motorcycle. When riders are asked what products they use to wash or detail their bikes their answers vary. Some Harley owners will say they only use Harley Products. When this is their answer I wonder if their routine maintenance products are all Harley-Davidson Brand. Taking it one step further, was that custom paint done at the dealership? Goldwing owners will often have the same answer regarding Honda Products. Amazingly, both Harley and Wing riders complain about the cost of the products they use to detail their motorcycles. The secret to motorcycle detailing is using products specifically formulated for motorcycles. Using a product developed for cars can work but it may also cause damage. Cars are designed with an exterior and interior, motorcycles are not. Motorcycle wash and motorcycle detailing products must be safe for multiple surfaces. 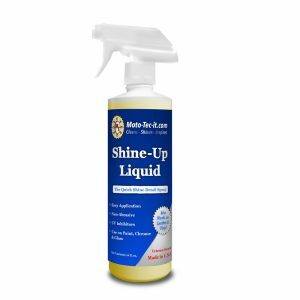 Shine-Up Liquid is a best-kept secret. The formula will detail motorcycle chrome bumping the shine to a glisten. It will also bring paint to a luster, bringing out all of those special specks of color. The formula provides protection to the paint and will revitalize leather without making the surface slick. What makes this product unique is the formula. The formula contains no petroleum distillates, acids or alcohol. Just a spritz of spray and a wipe with a soft cloth reveals the shine. If you would like to receive our newsletter sign up here. You can follow us on FaceBook.